Bromi-Talc PLUS Foot Powder is a bromidrosis deodorizing powder that combines Talcum with the astringency of Potassium Alum, the absorbency of Bentonite, and the enhanced deodorant properties of Sodium Potassium Aluminosilicate ("Abscents" ). The combination of these ingredients reduce foot sweat ( sweaty feet aka hyperhidrosis), which in turn, reduces foot odor causing sweat (bromidrosis or perspiration odor). The sweat that does perspire is affected by the Sodium Potassium Aluminosilicate ("Abscents"). The Abscents remove the organic molecules that cause foot odor, rather than masking the odor with fragrance. 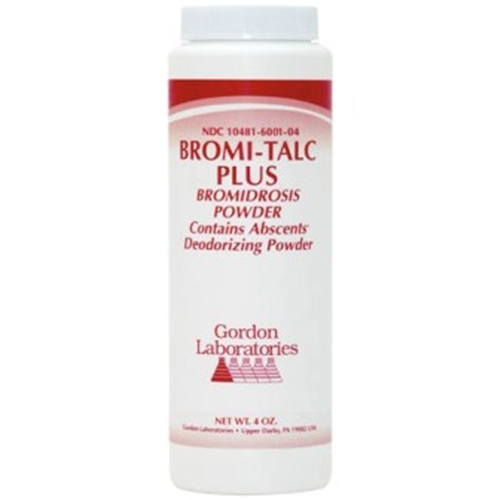 If you have very stinky feet, then Bromi-Talc PLUS Foot Powder by Gordon Labs might help. Bromi-Talc PLUS Foot Powder directions for use: Dust on skin once or twice daily or as prescribed by your physician to eliminate bromidrosis (perspiration odor) and hyperhidrosis (excessive sweating). Bromi-Talc PLUS Foot Powder comes in a 4 oz bottle.